Description This expressive figure of a mournful siren playing the kithara, a musical instrument like a lyre, originally crowned a funerary monument. Sirens were mythical creatures that were part-woman, part-bird, who, while best known as temptresses, also used their powers of song to praise men of great fame, and thus appear frequently on funerary monuments of the 4th century BCE. The Odyssey and Ancient Art. Edith C. Blum Art Institute, Bard College, Annandale-on-Hudson. 1991-1992. Ulisse: Il mito e la memoria (Ulysses: The Myth and Memory). Palazzo delle Esposizioni, Rome. 1996. Ulysses, Myth and Memory. Haus der Kunst, Munich. 1999-2000. 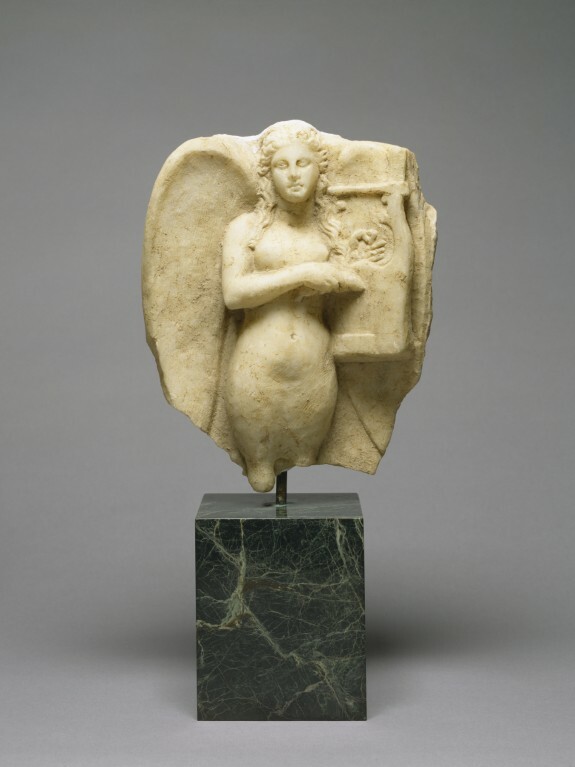 Things With Wings: Mythological Figures in Ancient Greek Art. The Walters Art Museum, Baltimore. 2005-2006. Things With Wings: Mythological Figures in Ancient Greek Art. Ward Museum, Salisbury. 2009. Underworld: Imagining the Afterlife. Getty Villa, Pacific Palisades. 2018-2019. Provenance Moise Emanuelides, Athens, 1923 [date and mode of acquisition unknown]; Joseph Brummer, New York, 1923, by purchase [Brummer inv. no. 793]; Henry Walters, Baltimore, 1924, by purchase; Walters Art Museum, 1931, by bequest.